I want to take a moment to examine Imperial Storm Troopers. most tournament players will tell you that they are overcosted for what they do, that veteran squads are better and that they don't measure up to the other selections in the elite section of the IG book. However there seems to be a trend, especially amongst Praetorian players, to convert and/or run stormtroopers in their armies. Today I wanted to share my experiance running these elite troops and also ask everyone else to share their thoughts, both pro and con, on the "glory boys"
Storm troopers are some of the most versitile troopers on the board. they can scout, infiltrate or deepstrike for deployment options and dependant on who you are playing against you can change these options around (so long as you make your choice pre deployment.) If your opponent is aware of this ability it lends a bit of uncertainty to their pre-battle plans. 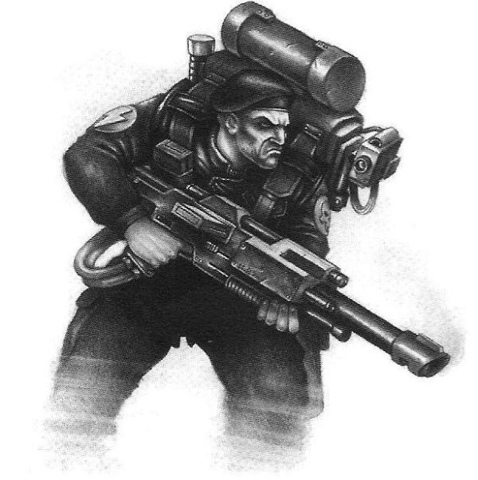 Each game played can change the way you use these guys, similar to penal legion troopers but with the choice of ability. I've been running a ten man stormtrooper squad in my lists armed with two plasmaguns. I find that this formation allows me to put out a good amount of firepower on enemy squads which couples well with the psychic battle squad I like to run. Imagine this scenario, a 10 man squad deepstrikes/outflanks onto the board. they deliver 15 ap3 lasgun shots and 4 plasma shots into an enemy squad. luck holding you will manage to cause a 25% morale check. The psychics of course are there to drop the enemies leadership score so they need snake eyes to stay on the board. This combo has worked for me very well and I've seen squads, often with independant or special characters attached, run off the board without doing any damage to me in return. The stormtroopers usually die in the next turn or two but they have succesfully seen 100% - 200% of their points value eliminated and soaked up firepower that otherwise would be dumped into my scoring units.